Koletzko S, Niggemann B, Arato A et al. Diagnostic approach and management of cow’s milk protein allergy in infants and children : ESPGHAN GI Commitee Practical guidelines. 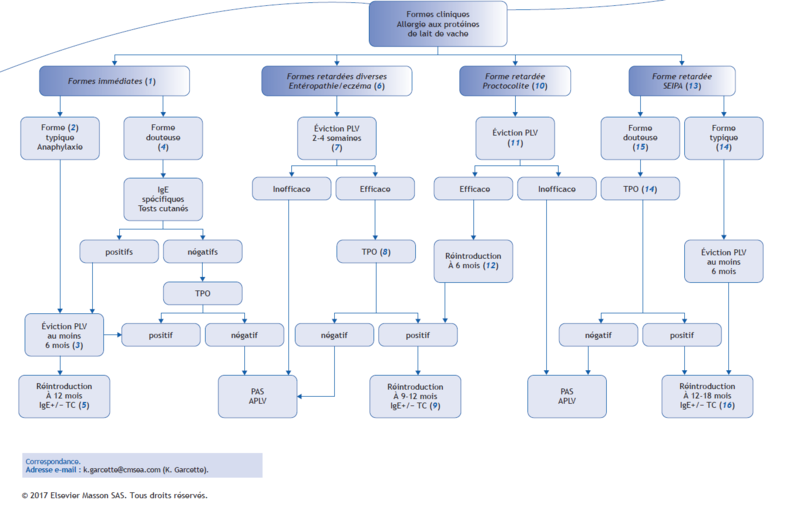 J Pediatr Gastroenterol Nutr 2012;55:221-9. Fiocchi A, Brozek J, Schünemann H et al. World Allergy Organization (WAO) Diagnosis and Rationale for Action against Cow’s Milk Allergy (DRACMA) Guidelines. Pediatr Allergy Immunol 2010;21:1-125. Lifschitz C, Szajwesa H. Cow’s milk allergy : evidence-based diagnosis and management for practitioner. Eur J pediatr 2015;174:141-50. Nowak-Wegrzyn A, Katz Y, Mehr SS et al. Non-IgE-mediated gastrointestinal food allergy. J Allergy Clin Immunol 2015;135:1114-24.